The following is a guest post by Alan S. Blood, author of Rogue & Royal. If you would like to write a guest post on my blog, please send me an e-mail at contact@cecilesune.com. After the misery of Oliver Cromwell’s republican ‘Protectorate’, following the execution of Charles I, his son is restored to the throne. Britain thankfully returns to monarchy. King Charles II is different from his father. He is roguish, and nicknamed ‘The Merry Monarch’, loving festivities, gambling and horse racing. His Queen, Catherine, fails to produce an heir, yet he has many mistresses and fathers several illegitimate children. Highly intelligent, he has innumerable interests and furthers both science and astronomy. Although happier, his reign has problems especially achieving balanced religious tolerance between Catholics, Protestants and, alarmingly, the rebellious Nonconformists, whose terrorist ‘Fifth Monarchy Men’ pose constant threats. Amongst these is another ‘Rogue’, religious fanatic, womaniser, kidnapper, suspected ‘double agent’ and a thief renowned for a spectacular heist for which he should have been executed. Instead, as one of our greatest mysteries, he is pardoned by the King. Alan S. Blood is an author who worked in advertising and the civil service, in London, before qualifying as a teacher from the University of Reading. He enjoyed a long, distinguished career in this profession. Alan now devotes his time to writing novels, plays, screenplays and poetry and has widely traveled the world, especially undertaking research in Chile where some of his novel, Cry of the Machi: a Suffolk Murder Mystery, is set. The story concerns ritualistic killings around a team of Suffolk Morris Men with a supernatural link to a Patagonian ‘Machi’ of the Mapuche Indians. There is also the involvement of organised crime. He was previously a Cotswold Morris Dancer with two different dancing ‘sides’. 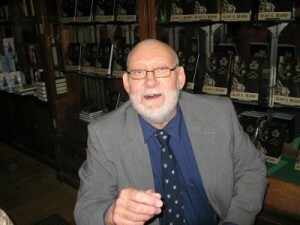 Alan’s previous novel was Once Upon A Castle, a teenage ghost story set in World War II. His latest novel Rogue & Royal is set in 17th century Britain which, although centered upon the stealing of the British Crown Jewels, examines the far wider issues of terrorism, espionage and political intrigue before and after their connection with this remarkable event. Alan now lives in Wales next to the Irish Sea and enjoys wildlife photography around the beautiful Welsh coast, mountains and countryside, as well as continuing his artwork with painting and scraperboard engraving. About the author and his work: Alan S. Blood’s Website. Alan S. Blood is an author who worked in advertising and the civil service in London, before qualifying as a teacher from the University of Reading. He enjoyed a long, distinguished career in this profession. Alan now devotes his time to writing novels, plays, screenplays and poetry and has widely traveled the world, especially undertaking research in Chile where some of his novel, "Cry of the Machi: A Suffolk Murder Mystery", is set. The story concerns ritualistic killings around a team of Suffolk Morris Men with a supernatural link to a Patagonian ‘Machi’ of the Mapuche Indians. There is also the involvement of organised crime. He was previously a Cotswold Morris Dancer with two different "sides". Alan’s first novel : "Once Upon A Castle" is a teenage ghost story set in World War II. 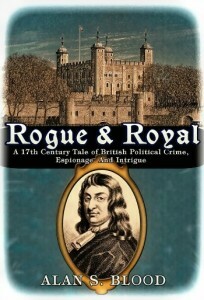 His novel "Rogue And Royal", set in 17th century Britain, although centered upon the stealing of the Crown Jewels, examines the far wider issues of political intrigue and espionage before and after their connection with this remarkable event. Alan now lives next to the Irish sea and enjoys wildlife photography, both around the Welsh coast and countryside, as well as painting and scraperboard engraving.